History is what survives, and what survives is not always the common or the typical. Collectors of postal history depend mostly on archives which, for one reason or another, have escaped the bonfire, the flood, the bombing raid, the mission to search and destroy, human carelessness, and much more. For many years, I have collected – accumulated, really – material from Podolia / Podilia in west Ukraine. It is an agriculturally rich region and has been much fought over. In the 1930s and 1940s, Stalin’s collectivisation campaign there turned into mass starvation and German occupation turned into mass liquidation. One result is that though the region historically had a large Jewish population, part of it scattered across scores or hundreds of shtetls which dotted old maps and another part established in the larger towns, very little evidence of this Jewish presence now turns up in the postal history available. It is rare to see postcards with text in Hebrew or Yiddish and also rare to see envelopes addressed in a Cyrillic script with the distinctive style of someone who learnt first to write in Hebrew script. The letter below is interesting for several reasons. First, it is going from Kamenetz / Kamyanets Podolsk across the border into Romania, to Iasi / Yassy; there is a routing instruction for it go via Novoselitz[ia]. Second, it has a quite scarce pre-philatelic double-ring cancel of Cyrillic KAMENETZ PODOLSK dated 1858. Third, inside there is a long business letter from a business which uses an embossed handstamp in German, near the postmark, and reading SALOMON RABINOWITZ / KAMENETZ PODOLSK / RUSSLAND. 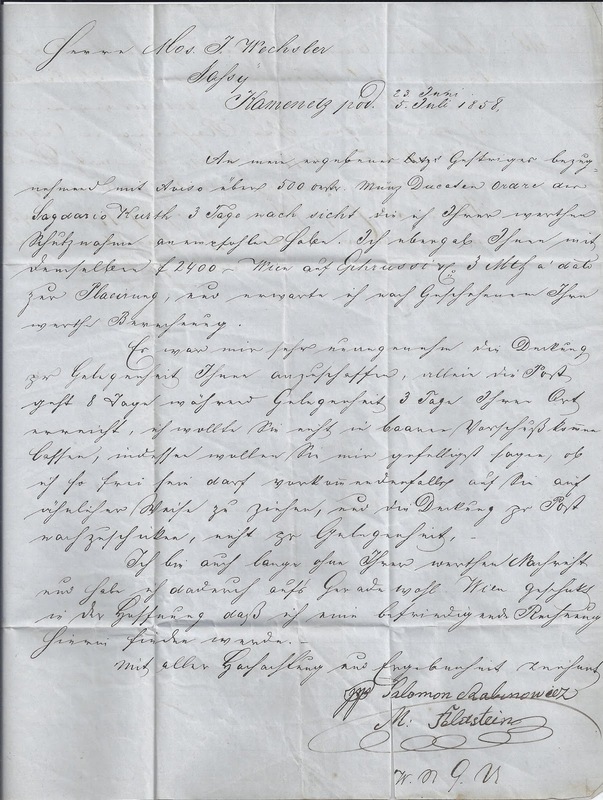 The letter is written in German, double-dated for Julian and Gregorian calendars, and in a script which suggests the writer had his education in a German-directed school. This is a script which defeats me ...But it is signed at the bottom by M.Feldstein on behalf of (pp) Salomon Rabinowicz [now with a Polish spelling at the end – cz instead of the –TZ of the seal]. The script is that of someone who is not at ease in Roman letters, and I guess was more at home writing in Russian or in Hebrew/Yiddish. But either way this is a letter from a Jewish business in Kamenetz. 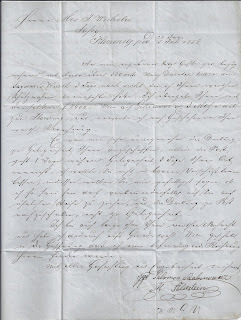 I cannot read the first part of the addressee’s name which has J. as a middle letter and Wechsler as a Jewish surname which seems to have been common in Iasi. Hello Trevor, it appears to be standard German in a floral type of script. Any chance of obtaining a high quality scan?